So which cards, exactly, have been chosen to represent the epic lore of Magic? Read on to find out! The queen in question is Oona, Queen of the Fae and manipulator of The Great Aurora, on this card originally from Shadowmoor. Hers is the form that appears in the clouds, impassively weighing the pleas of the tiny figure before her. Jason Chan's artwork beautifully conveys her ethereal, incomprehensible form; she's less a true Faerie and more a being of pure magic, and she does not grant favors without a price. In the Odyssey block storyline, the Cabal were a truly evil, black-aligned religious faction that would bolster their power with occult rituals and dark magic. Torment, where Cabal Ritual originally appeared, was heavily weighted toward black and contained a lot of graveyard-related abilities, making the card a perfect intersection of story and gameplay. 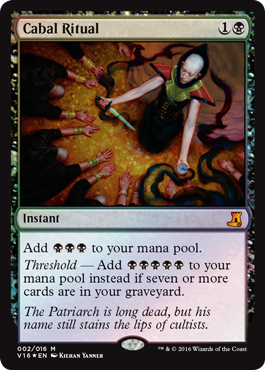 The new art by Kieran Yanner (and the updated flavor text) suggests that even now, the Cabal has not given up its sinister ways. "The Conflux" is the name given to the reunion of the Shards of Alara, an event that would release massive amounts of power. And of course, who else would have their claws wrapped around this colliding font of multicolored mana but Nicol Bolas, whose machinations sought to steal the power released by the Conflux. 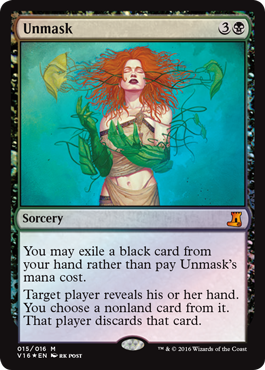 Much like the Conflux in the story, this card allows you to put your ultimate plan into motion, as all the different pieces come together. 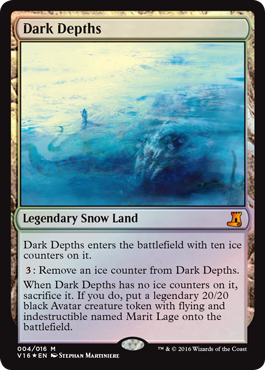 A land that produces no mana is always a strange sight, but at least the reason is obvious here: there is an enormous, otherworldly tentacle monster frozen inside the Dark Depths, suppressing or consuming its magical energy. 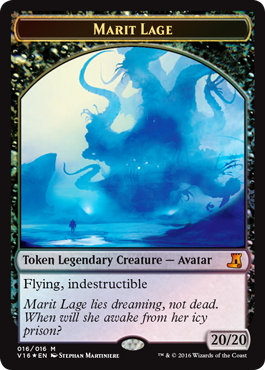 As the frozen continent of Terisiare began to thaw in the Coldsnap storyline, some things were revealed that perhaps should have stayed hidden...including Marit Lage. 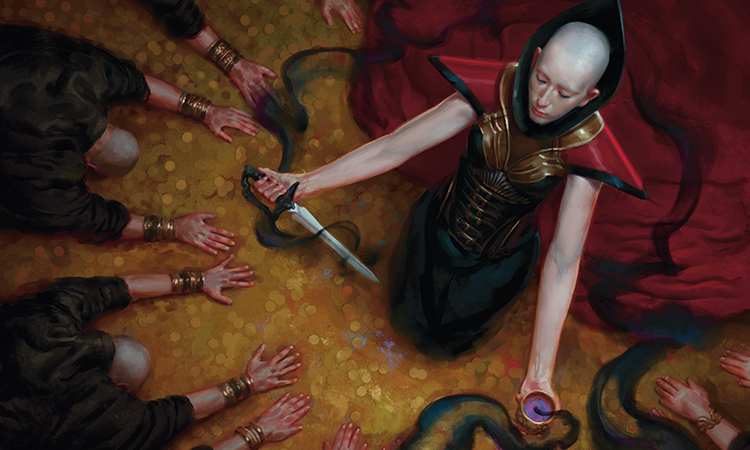 She is a cosmic being of inscrutable origin and incredible danger, and to this day has the highest base power and toughness of any creature in Magic. Poor Glissa. An Elf of Mirrodin once called Glissa Sunseeker, she spent many years seeking answers and vengeance for her family's deaths, only to be faced with bad luck and betrayal at every turn. After finally defeating the mad construct Memnarch at great cost, she returned to her people—only to be blamed for every atrocity she'd fought against. 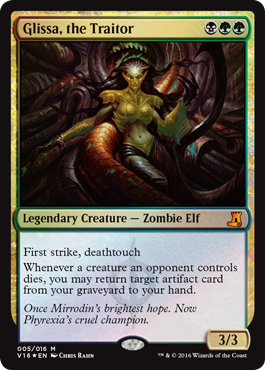 Shunned by those she cared for and corrupted by Phyrexian oil, Glissa succumbed to the Phyrexian infection, becoming Vorinclex's greatest champion. Now she fights for Phyrexia. Sorin Markov created the Helvault at the same time as the Archangel Avacyn, out of a sliver of Innistrad's silver moon. That moon has powerful magical properties, and even this sliver was enough to contain the hordes of Demons assailing the plane. But when Avacyn sought to trap the ancient Demon Griselbrand, he dragged her in with him, allowing evil to flourish unchecked on Innistrad. 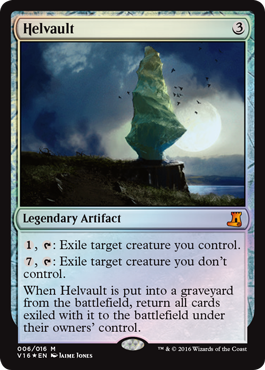 Only through the Helvault's destruction could Avacyn be freed to balance and protect the plane once again—at least until the events of Shadows over Innistrad. Created by Karn as the sentient incarnation of the maddeningly powerful Mirari artifact, Memnarch was an artificial being of immense curiosity. Karn left him to watch over the metallic plane of Argentum, but he came into contact with Phyrexian oil and gradually became corrupted by its influence. 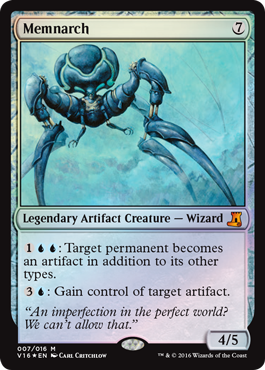 He renamed the plane Mirrodin, began filling it with kidnapped life forms from other planes, and performed terrible experiments on them in his obsessive quest for a Planeswalker's spark. The Mirari was a dangerous artifact, and its power was seductive. Not only did it offer a tremendous amount of magical energy, it had the ability to see and manifest its user's deepest dreams and desires. 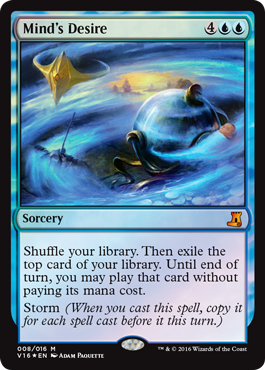 However, it also had an unfortunate tendency to bring its users to eventual ruin, and its presence on Dominaria led to magical chaos. Adam Paquette's vivid new art, like the Scourge original, offers a glimpse of the Mirari's swirling, wish-granting power. 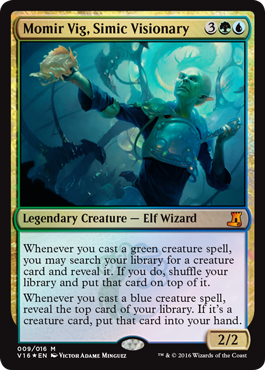 No one else embodies the Simic Combine's focus on the evolution of life itself quite like Momir Vig. Under his influence, the guild shifted from fighting to preserve the essence of Ravnican life forms to working to improve them, regardless of whether the subjects particularly wanted to be improved. Victor Adame Minguez's new art zooms in more closely than the Dissension original, to show us Momir Vig impassively eying some sort of hybrid frog-lizard he has no doubt created. 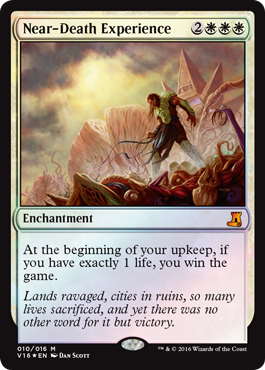 Though Gideon is the figure depicted here—exhausted, wounded, but triumphant against incredible odds—the name could just as easily refer to all of Zendikar. When the Eldrazi titans first began to stir in Rise of the Eldrazi, their broods of monstrosities nearly destroyed the plane once and for all. But with Gideon's help, the Zendikari survived and thwarted the initial assault, forcing the Eldrazi to regroup and setting the stage for the events of Battle for Zendikar. 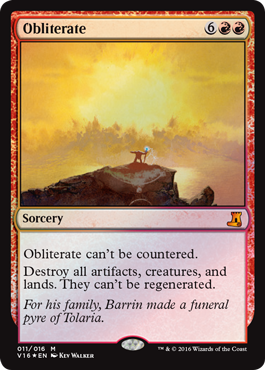 The wizard Barrin played many important roles in his life: headmaster of the Tolarian Academy, right hand of Urza, slayer of Keldon champions. But he could not save his wife, Rayne, who fell in battle, nor his daughter Hanna, who was killed by a Phyrexian disease. When he returned to the Academy and found it overrun by Phyrexians, it broke him, and he unleashed a forbidden spell that annihilated everything in the area, including himself. His last act is depicted here, fittingly, on the ultimate board wipe. The Phyrexians have been a scourge of the Multiverse for a very long time. Yawgmoth, their progenitor, was obsessed with "perfecting" all life forms under his control through the hideous fusing of metal, flesh, and magic. Even after his demise, the Phyrexians continue his work, spreading their corruption wherever they can. 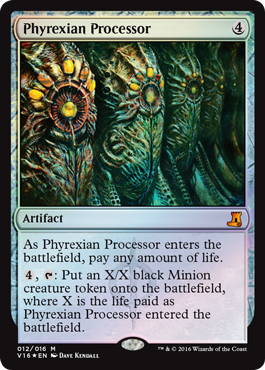 Phyrexian Processor, originally from Urza's Saga, is emblematic of their methods: pain and death are entirely reasonable prices to pay for true power. 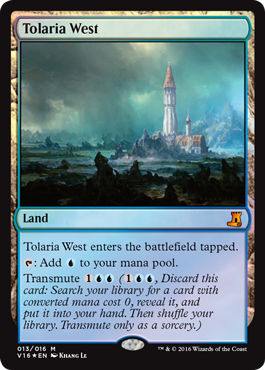 All of Dominaria has been battered by various destructive forces throughout Magic's storyline—time rifts, bloody wars, an ice age, and more—but the island of Tolaria, home of the famous Academy, might have gotten the worst of it. Many years after the entire island was obliterated by the grieving wizard Barrin, a new magical academy was founded, named Tolaria West in honor of its doomed predecessor. 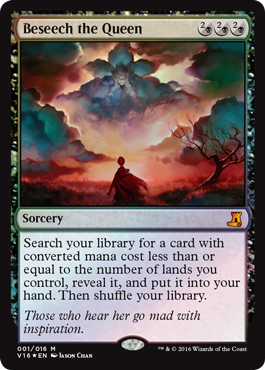 This card originally from Future Sight also has the distinction of being the only transmutable land in the game! Toshiro Umezawa (Toshi for short) was a rogue Samurai from Kamigawa whose journey took him from criminal enforcer, to servant of dark spirits, to hero of the Kami War. He wielded kanji magic and possessed a powerful artifact that allowed him to move between any shadows in the world. 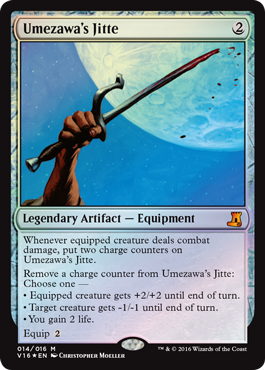 His Jitte, from Betrayers of Kamigawa, offers us a glimpse of his cunning and versatility, appropriately represented by one of Magic's most sought-after pieces of Equipment. The saga of the ship Weatherlight and its crew, and their multi-planar series of adventures, spanned many Magic blocks. One of those blocks was Mercadian Masques, in which the Weatherlight crash-landed on Mercadia and her crew became embroiled in the conflict between the Mercadians and the Cho-Arrim. Meanwhile, the shapeshifter Volrath sowed confusion and dissent among the crew while disguised as Takara, eventually murdering Takara's father, Starke. Here, we see him shapeshifting out of Takara's form. Now that you know the backstories, look for From The Vault: Lore at your local game store on August 19! Until then, I'll leave you with a better look at Kieran Yanner's new painting for Cabal Ritual.